Who is the author of the website? Who do they represent? Is the author a qualified expert in relation to the information presented? Has the other written other things? Does the website cite other sources for information? Do other websites give the same information? Does the site have overall integrity and reliability? Are links functioning or broken? Is the information presented recent or outdated? ​Is information provided balanced, objective, factual or subjective and opinionated? Is the point of view balanced with supportive arguments? What is the purpose of the website? Who is the intended audience? Is the information relevant to your needs? How in depth does the information go? 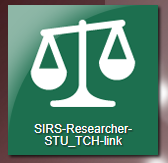 What does the URL represent? Boolean Operators are AND, OR, NOT. Using these operators while searching allows you to combine or exclude keywords in a search, which will help provide more precise results. Boolean Operators are easily understood through Venn Diagrams. Using AND will only show sources that include both keywords in the search results. Using OR will show sources that talk about either keyword. Sources may include one or both keywords. Using NOT will only show sources that include the first keyword but not the second keyword. When starting research, it is best to use keywords (closest to natural language) that yield many results. Then use subject terms (predesignated tags for a resource) that yield more relevant results. To narrow even further, use advanced search features. 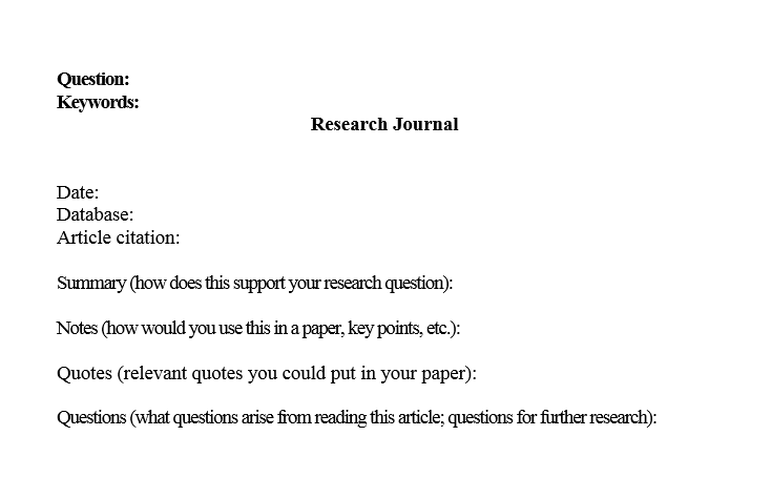 Keeping a research journal is a time saver. 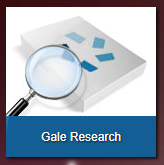 Use it to store all relevant information while doing research so you don't have to go back and search for information later on. Saving it in a collaborative Google Doc allows you to easily share resources and ideas with your partners while everyone remains accountable for their work. 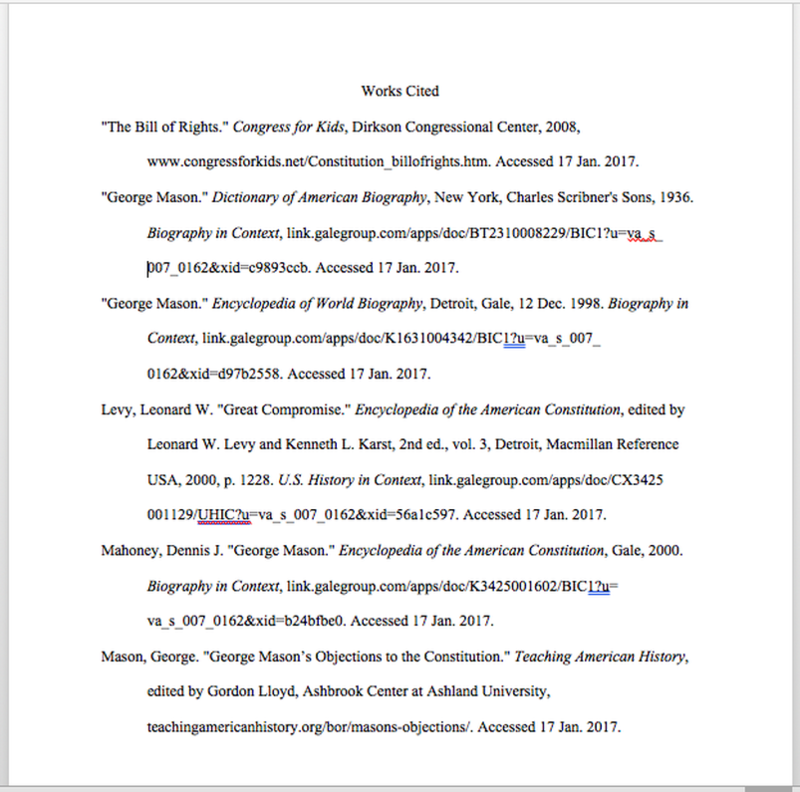 A bibliography, also called a Works Cited page, is a list of citations for the sources you use in a project or paper. These sources may be books, websites, magazines, videos, audio files, and more. You must follow formatting requirements for a bibliography page. Title-"Works Cited" or "Bibliography"- bold and centered on the page. All sources written using hanging indention, like the sentence preceding this one. The whole page should be double spaced. Citations may be copied directly from any school database.